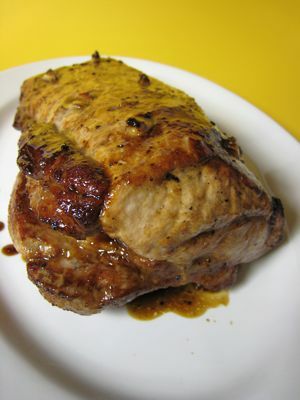 Remove the soaking pork loin from the fridge and rinse it under cool water. I decided I wanted an adobo flavor to this roask pork so I cut little slits in the meat and stuck in peeled cloves of garlic… I put several cloves worth, but adjust this to your personal taste. Next, stick the whole pork loin in a bowl and add soy sauce, vinegar, bay leaves and cracked black pepper and let this marinate for at least 4 hours, better if overnight. Then place on a pan with a rack, and roast the pork in a 375F oven, basting with the marinade at least 2-3 times over the course of an hour or so. Check the internal temperature of the roast if you have a meat thermometer. Add some water to the pan to prevent scorching the drippings from the roast. As soon as the internal temp gets to 140F, then add half a cup of muscovado or dark brown sugar to the remaining marinade and slather this mixture on the pork loin and return it to the oven for another 15 or so minutes until the sugar is melted and the roast is done. Check that the meat has an internal temp of about 160F and remove from the oven. If you are lucky, there is enough sauce or gravy to spoon over the roast. If there isn’t add a bit of broth or water to the pan. After the roast has rested for 10 minutes, slice it thinly and lay it out on a serving platter. Spoon some of the pan gravy over the slices. I don’t normally like very sweet meats, but surprisingly, this dish was sweetish but not cloyingly so. It was reminiscent of adobo, but only partially so. It was excellent served with some rice and creamed corn. Yum. Oh, you may want to remove the garlic cloves before serving, they can be a bit overwhelming… And one last tip. Don’t overcook the pork. I know you have been conditioned to belief that pork must not have a trace of pinkness whatsoever to the meat, but just as undercooking it may be bad, overcooking it results in cardboard-like tasting meat… invest in a good meat thermometer the next time you see one. Yes MM, I like my pork pink and on some occassions medium-rare!!! Since trichinosis isnâ€™t as much of a concern as it was years ago and if you trust your butcher sourced his hogs from farms that raised them properly, there is no reason to be afraid. You gave me a great idea to make this the “palaman” for the Ciabatta panino for my kids “baon” this week!!! Thanks MM!! I have always believed that local pork (i.e. from the Philippines) is tastier- it has more ‘character’ than the ones available in the US. Is it because the local version is ‘self-supporting’? Ha ha ha! 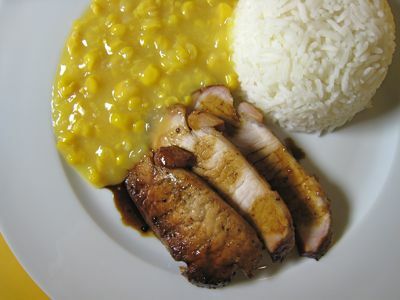 I’ve never tried pork loin adobo as I always preferred mine with a little fat and pork loin is always cooked asado style in our household…I think this is a unique twist to the usual adobo and have never encountered such in my 2 adobo cookbooks. I don’t have meat thermometer, is it possible to just make ‘tancha’ or something? This is a very very interesting take on adobo.. Interesting take on adobo. Or pork loin, for that matter. =) question: Do internal Temps vary per meat or is 140 a good basis for doneness for all types of meat? Thanks MM. Interesting. 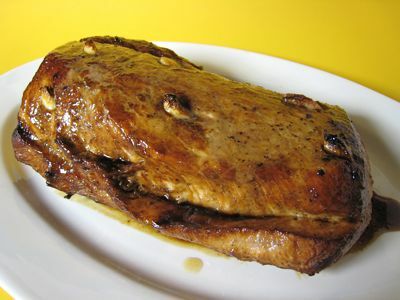 I’ve always put garlic in my pork roast (sabi kasi ng Mama ko matabang pag wala) but never tried it with soy sauce or with sugar. Must try. hello…im new here ..can i use turbo broiler pag walang oven? It was great meeting you the other day. I really enjoy the results of brining pork loin prior to roasting. One thing you should consider for future experiments is using the sous vide technique on pork. This technique was developed decades a go by french chefs wanting to limit shrinkage in foie gras. It’s basically marinating the meat in a vacuum sealed plastic bag and then immersing the bag in a temperature controlled bath with an immersion circulator. When the technique is done properly the resulting tenderness is extremely tender. After this process the meat should be finished with either a torch or a broiler. I have been fortunate enough to eat fresh bacon made with this technique. It was suoerb. Your post has given me the idea to make pork belly adobo using the sous vide. 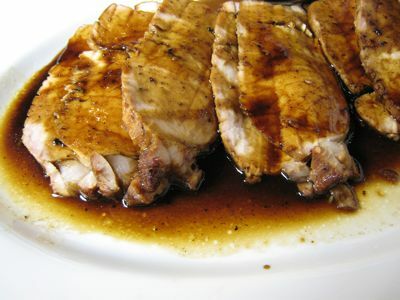 i love pork especially those with the marbled fat like pork steak but never tried pork loin.. this is something i can try since hubby is avoiding fatty foods due to gall stones.. i think roast pork wouldn’t be that too much of a cholesterol magnet, after it has rendered fat and juices, i think this recipe would be good for the hubby.. thanks MM! I never thought pork can be done this way! Btw, MM I already written down the procedure for brining meats on your previous posts and I must say that it work wonders on our palate! Thanks! Verry interesting, MM. A must try for sure! BTW, I did the Lechon Sinigang thingie and sorry to say, it did not rock my boat. Overall taste came out short and on the bland side. Maybe I did not use enough lechon (i used 3 legs or hooves) and the dish was supposed to be for just me. My daughter laughingly tells me that my taste buds are shot because of all the stuff I try. Whatever. I will try this again with more lechon. I cut off the toenails ‘cuz they gross me out! This looks so good. It’s like adobo/asado porkloin. MM, looks good! Just right for my pre-Christmas binge South Beach Diet! I will have to substitute the sugar for something else, though. Oh,I brined pork chops before grilling and they were indeed juicier (and a tad saltier) than the un-brined ones. Will adjust salt and brining time til I get it right. hi, nice tips, ms. connie of pinoy cook also share that kind of idea (she got that also from steamy kitchen? i think), now i know that really work in every meat. this looks really yummy.. in contrast with MM, I do like sweetish-strongly flavored meats.. but I don’t like them artificially flavored like many of the tocinos available..
love roast pork; was in baden baden, germany over weekend and had their specialty, roast pork marinated in beer served with cabbage and roast potatoes. i imagine this is brining too…only 10euros for 2 big slabs of pork+veggies! will try your adobo version. had this after spending 3 hrs at the friedrichsbad(spa). my bro. got the MM tshirts..can’t wait to get them in feb.